I have a confession to make. 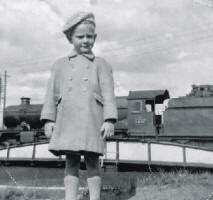 As a child, I was a train spotter. And a bus spotter. I even managed to squeeze in a couple of trams before the Mumbles Railway closed. My real problem was that nobody tried to stop me; if anything, I was encouraged! Quite how it all came about is unclear, but more than likely it resulted from a boisterous Sunday morning which culminated in my father “getting me out of the house for a few hours”. In search of peace he would take me either to the docks, Landore locomotive shed, a bus depot or (best of all) on a ride to Mumbles on what most people referred to simplistically as ‘The Mumbles Train’. All the evidence suggests that from an early age my interest in transport matters was more than simply utilitarian! I was aged about two at the time. having survived the years better than I have! in readiness for a run to Paddington no doubt. From our home, at that time in Manselton, we would catch what I later discovered was an SWT AEC Regent running on service 72 (from Penlan) to ‘the slip’. For the uninitiated this was the local, unofficial name given to the area near Swansea baths, beneath Mumbles Road footbridge, which in the early 1950s was a fairly important public transport interchange. Several SWT bus services from north Swansea passed here, and connected with the Mumbles railway at this point. Sometimes, however, we would spend an hour on the beach, where the occasional steam-hauled Central Wales line train heading to or from Swansea Victoria would pass, leaving behind it a swirling trail of sand. The locomotives hauling these trains started to fascinate me. Of course, I was too young then to identify locomotives individually, but I must have seen Stanier 8Fs, Jubilees and British Railways standard classes coming and going. Take a look at Mumbles road today and it’s hard to believe there was ever a railway there at all. The Swansea bay line, which closed in 1964, also passed through the suburbs of Killay and Dunvant along what is currently a cycle path. It had its ancestry with the London and North western Railway, later becoming part of the LMS. Indeed, the Clyne Valley cycle path is often referred to as ‘the old LMS line’. For Great Westernry, you had to go to High Street, where Castles, Manors, Halls and their smaller cousins abounded. I remember being quite keen on the small pannier tanks, which were the staple fare on lighter duties throughout the former GWR territory. I can’t actually remember much about visits to Landore shed, but I must have gone there; I have a somewhat embarrassing picture (above) to prove it! (I digress). I always preferred to travel onwards from the slip either to Oystermouth or to Mumbles Pier on the large, red 106 seat trams which, to a small boy, seemed enormous; more so when two were coupled together. The Swansea and Mumbles cars had a distinctive smell when you boarded them – some sort of cleaning fluid or disinfectant, probably. Motors would whine as they pulled away and the driver would sound the air whistle as the journey progressed. At speed, the cars would bounce and rattle to the accompaniment of the pantograph hissing along the wires. On reaching the terminus the conductor would walk through the car, pushing over the seat backs two at a time; on each occasion there would be a loud crash as the seats found their position. We used to go to Mumbles on Thursdays, too, in those days. It was early closing day in Swansea and in common with many others, the family would go out for the afternoon. In summer there would be long queues for the trams, but they always coped and no-one moaned about waiting. If I was particularly good – or if I protested loudly enough – I would be taken to Rutland Street depot to see the trams lined up. There were only 13 but to me, in those days, there seemed to be many more. One day in 1959, my parents must have broken the sad news that the Mumbles Railway was to close; such a concept must have been difficult to impart – rather like losing a favourite friend, I suppose. I don’t expect I really understood what was happening, even when I was allowed to watch the closure on the evening news one night in January the following year. I can, however, recall being puzzled when subsequently I saw the track being lifted. The full realisation of what was going on finally came home to me when I saw those wonderful trams being cut up for scrap, on site outside the depot. I still wonder why those who protested (and who continue to protest) so loudly against the line’s closure actually did so little practically in terms of preserving any of it when the end finally came. We still went to Mumbles after this, of course, but even with those AEC buses which held so much fascination, it wasn’t quite the same. A minor diversion from the sad events of January 1960 was afforded by a fleet of silver AEC Regents. I suppose this must have been about the time of the Suez Crisis, when oil based products increased rapidly in price. To save money, several bus companies, including SWT, experimented with unpainted vehicles which, though cheaper on paint, became quite a liability in terms of appearance; complete aluminium body panels had to be replaced when only minor damage had been sustained. Later on, my father would lift me up to the gate at the rear of Swansea Museum to see the severed cab of Mumbles car no.7. In my teens, as a junior member of the Railway Club of Wales, I would earn my apprenticeship as a preservationist on this vehicle and help to save it from the inevitable fate. Happily, no. 7 is still with us, now safely displayed at Swansea Maritime and Industrial Museum. From those humble beginnings has developed a strong sense of our transport heritage and an irrevocable association with the transport preservation movement. 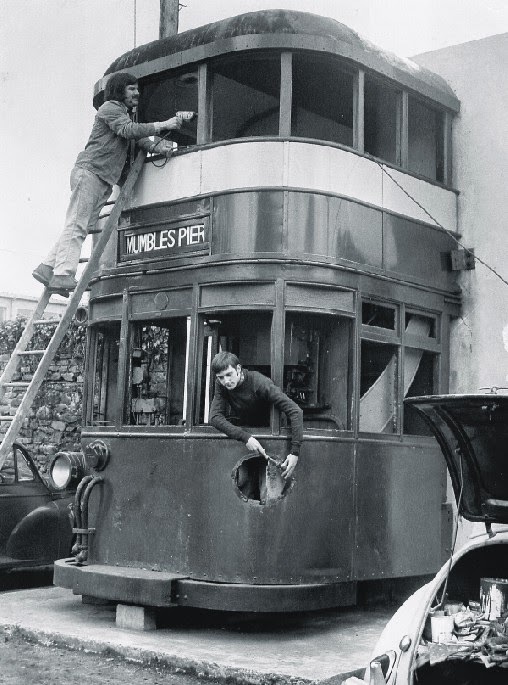 Restoring Swansea and Mumbles car 7 in 1972-73; I'm the one in the cab! Growing up in an environment in which transport, in all its forms, played such an important role during the impressionable years has, undoubtedly, had a lasting effect.